Do you have a sweet tooth, or a savoury tooth? Most of us have a preference for one kind of food or another - but in both cases we need to take care not to overload our plates, and our calorie counts. You can satisfy your craving for sweet recipes without resorting to high calorie, cream-laden gateaux; and, similarly, the tastiest savoury food does not have to be drenched in butter-rich sauces. For a low calorie lifestyle, you can start by taking an honest look at your portion sizes. Cooking low calorie food and then eating twice as much as you should, will wreck your healthy eating plans. However, eating more vegetables with your savoury meal, and more fruit with your sweet course, will help fill you up on low calorie food that is good for you. Reserve 55 grams of fruit for decoration. Put remaining fruit in a pan with 2 tbsp water and bring to the boil. Reduce heat and simmer gently for 5 minutes until soft. Stir in the sugar. Remove from the heat and leave to cool slightly. Pour into a food processor or blender and puree. Sieve to remove any pips if required. Set aside to cool completely. Whip the cream with the grated orange zest until thick. Add the yogurt and lightly whip into the cream. Mix in the cold fruit puree. Spoon into dessert glasses and chill well before serving, decorated with reserved berries and orange zest. This easy and delicious hot pudding is a very low calorie 95 per serving. Preheat the oven to Gas mark 5 (190 degrees Celsius). Lightly grease four individual souffle dishes and dust lightly with flour. Separate 3 eggs and place the yolks in a bowl with the fruit spread, grated lemon rind and cinnamon. Whisk with an electric hand whisk until mixture is thick and pale. In a clean bowl, whisk the 3 egg whites to soft peak stage. Using a metal spoon, fold the egg whites evenly into the yolk mixture. Divide the mixture among the prepared dishes and bake for 10-15 minutes, until well-risen and golden brown. Serve immediately, dusted with cinnamon. If you like savoury food you probably appreciate hot Mexican favourites like tacos and tortillas. When a taco has a huge serving of minced beef and added cheese, each one is likely to have around 500 calories, with a high fat content. Try instead a filling of around 2 tbsp of minced beef and a generous serving of tomato salsa instead of cheese in each, and you will cut the calories to around 220. 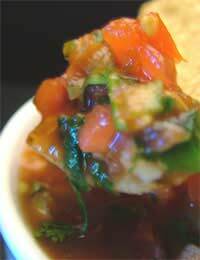 Make the low calorie salsa by dicing tomatoes, peppers, cucumber, spring onions and adding to a bowl with a tablespoon or two of lime or lemon juice (depending on quantity you are making). Add a few drops of Tabasco sauce and salt and pepper and some chopped basil or coriander. Cover and keep in the fridge until required but bring to room temperature for serving. Forget spareribs if you are serious about cutting calories - a 340 gram serving gives you 1260 calories, a whopping 72 per cent of them from fat. Go instead for a 170 gram portion of lean pork like tenderloin in a savoury sauce for a low calorie 200 calories. Serve with mixed vegetables. Remove any fat from pork and flatten the slices to about 5mm thick. Heat a non-stick frying pan over medium-high heat and spray with olive oil. Saute pork for 2 minutes on each side; remove from pan and keep warm. Add balsamic vinegar and pine kernels to the pan and cook for 1 minute, reducing liquid by half. Season the pork, spoon the sauce on top and sprinkle over parsley. Serve with a selection of vegetables, steamed and tossed with olive oil and salt and pepper.